Tdgrocks is the first Linux PC cluster of HPCCC installed at March 2003 with the support of the Teaching Development Grants of Hong Kong University Grants Committee, Dell Corporation (Hong Kong), Intel Corporation (Hong Kong), and Faculty of Science, HKBU. It was part of the Learning Computation Science on a Parallel Architecture Project, which purpose is to provide a learning and research facility for students from various academic institutions in Hong Kong on the subject of parallel/distributed computing. The cluster contains 128 processing cores within 64 Dell PowerEdge 2650 compute nodes, 2 PowerEdge 2650 login/management nodes. All compute nodes are connected via the Gigabit ethernet interconnect. 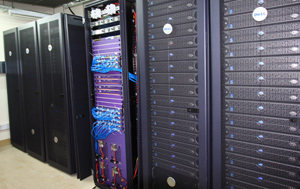 The cluster was the fastest academic supercomputer in Hong Kong and ranked 298th in Top500 supercomputer list on June 2003.